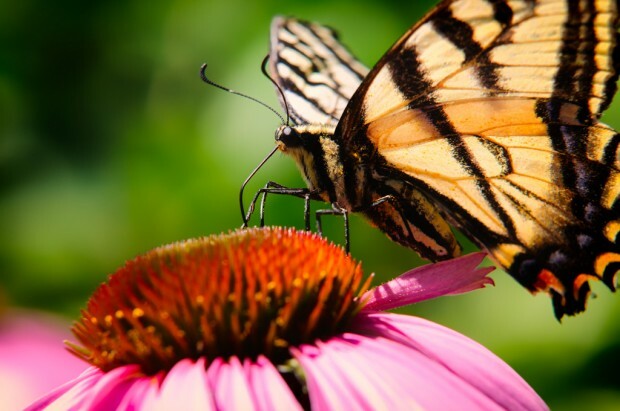 Backyard wildlife – butterfly drinking. Nikon D300s, Sigma 50-150mm f/2.8 lens with Kenko extension tube. Handheld, manual focus, natural light. I am fascinated by insects, and especially love bees. 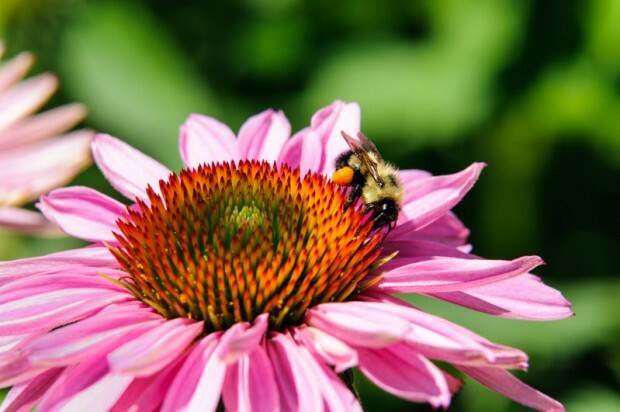 The importance of pollinators to our own livelihood is huge. One of the issues insects face in urban areas is a loss of habitat and suitable food sources. To help these little guys out, my wife and I have landscaped our garden to create lots of natural habitat for insects, birds, and other critters. It has been hugely successful, and for the last two years our garden has been alive with all kinds of life. Our garden has also become a great source of subjects for photography. Photographing insects and flowers is a lot of fun, but also has a few challenges. First, the minimum focusing distance of many lenses means that you cannot get close enough to the subject for it to be a reasonable size in the frame. As an example, my Sigma 50-150 f/2.8 has a minimum focus distance of one meter. That means I must be at least one meter away from the bee for it to be in focus! Macro lenses are specially designed to focus in at closer distances, however, they can be $500 plus for a fixed focal length lens. What to do? Extension Tubes to the rescue! These are a relatively inexpensive accessory that allows you to turn your existing lenses into an array of macro lens. Extension tubes, as the name suggests, are a tube that is placed between the lens and the camera body, moving the lens away from the sensor. This has the effect of greatly reducing the focus range, but also drastically reduces the minimum focusing distance. I use a set of Kenko extension tubes on my Nikon D300s and, as you can see from the images posted here, the results are quite reasonable. Check out Lens and Shutter in British Columbia, or B&H in the US for prices. Backyard wildlife. Nikon D300s, Sigma 50-150mm f/2.8 lens with Kenko extension tube. Handheld, manual focus, natural light. That’s some of my favorite kind of shooting, using the Zeiss Biotar, a very similar lens, on a short extension tube.